In preparation for Easter, Chef Tristan Welch of newly opened Parker’s Tavern, Cambridge has been hard at work to create an exclusive egg to celebrate the restaurant’s first Easter. 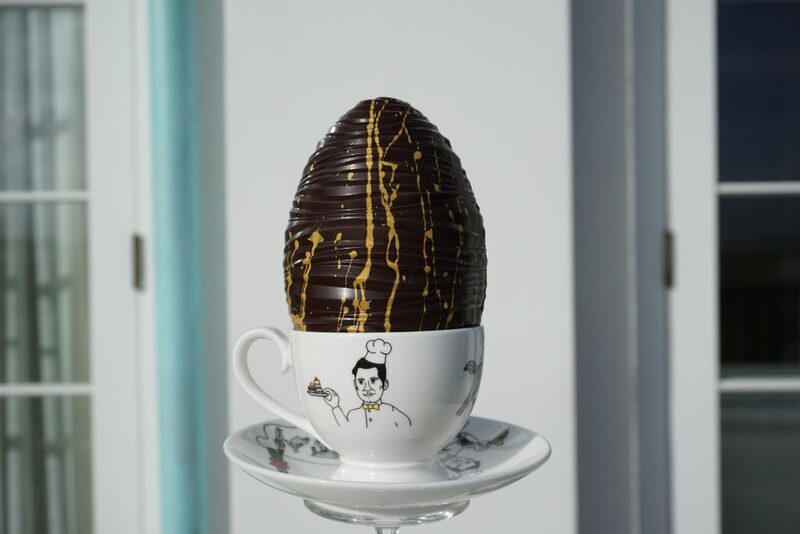 The luxurious chocolate egg is now available to purchase for £18 from the restaurant as well as online and is made from the finest ingredients, inspired by Tristan’s time spent cooking in the Caribbean. During his long stint as Executive Chef of The Cotton House on the island of Mustique, Tristan visited a cocoa plantation and noticed passionfruit vines were growing amongst the cocoa trees. In keeping with the mantra, ‘what grows together, goes together’, Tristan has brought a taste of the Caribbean to Cambridge and married these two tropical ingredients to create the most tempting of Easter eggs. The egg is made with the highest quality dark chocolate that is perfectly balanced by the passionfruit pâte de fruit in the centre, which unlike sweeter fruits, has just the right amount of acidity to cut through the richness of the chocolate. The Parker’s Tavern Easter egg has been carefully hand-tempered by the expert team and is beautifully crafted, finished with a sparkling gold splatter on the outside. The egg celebrates Tristan’s love for unique and playful pairings which is apparent throughout the entire food and drink menu at Parker’s Tavern. University Arms, Cambridge is also celebrating its very first Easter since opening on August 2018, by offering an exclusive Easter package for the whole family. Valid between 11th – 28th April, the hotel’s package starts at just £278 per night for a family of four and includes breakfast at the hotel’s destination restaurant Parker’s Tavern. What’s more, children under the age of 12 can enjoy a complimentary three-course dinner when booking this package and indulge with the likes of Tristan’s famous Spaghetti Bolognese, Grilled Chicken with Waffles and a Soft Whipped Ice Cream for desert. Parker’s Tavern restaurant is inspired by the communal dining halls synonymous with Cambridge Colleges and serves locally sourced, seasonal food, with every dish designed to be a whimsical re-imagining of a British classic, sourced from field, fen and England’s seas. Alongside the 110-cover restaurant, Parker’s Tavern is also home to a 61-cover bar which leads into the hotel’s beautiful library which serves a ‘Historical Cambridge Afternoon Tea’. The Library pays homage to Cambridge’s academic heritage and features a bespoke library curated by Heywood Hill, one of London’s leading bookshops. In celebration of Easter, Chef Tristan Welch and his team at Parker’s Tavern has created a luxurious chocolate Easter egg, made with the finest ingredients inspired by Tristan’s time spent cooking in the Caribbean. Bringing a taste of the Caribbean to the UK, Tristan has married the flavours of chocolate and passionfruit, combining the two tropical ingredients to create the most tempting of Easter eggs. Guests have the opportunity to purchase these eggs (£18) online or from Parker’s Tavern, so they can take a small piece of Easter at University Arms back home with them. First opened in 1834 as the city’s original hotel sitting on the iconic Parker’s Piece green, the University Arms has played an important role in the history of Cambridge. It reopened on 1st August 2018 following a £80 million refurbishment and the hotel is quintessentially English and the literary and academic spirit of Cambridge is one of its defining characteristics. The refurbishment was headed up by legendary classical architect, John Simpson and interior designer of the moment, Martin Brudnizki. John oversaw the replacement of the building’s 1960s and ‘70s extensions, restoring the hotel’s façade to its former glory in-keeping with Cambridge’s better-known architectural heritage, while Martin Brudnizki was mindful to create an environment reminiscent of school days past, lazy afternoons spent on the banks of the River Cam and the raucous revelry of students. University Arms sits on the iconic green – Parker’s Piece, situated right in the centre of Cambridge. During the Easter period, the city promises something for the whole family and those staying at University Arms are walking distance from a plethora of activities. Punting on the River Cam is a must, as well as a visit to Cambridge’s most famous house – Kettle’s Yard and the nearby Zoology Museum which opened last year. Those looking to truly get into the Easter spirit can attend one of the King’s College Easter Services at the nearby chapel between 18th – 21st April. In addition, hotel guests can borrow the bespoke University Arms Pashley bikes, allowing them to explore the city in style, while the Parker’s Tavern team can whip up a delicious picnic for the family to enjoy in a beautiful location of their choosing. For more information please visit: www.universityarms.com/Easter or call 01223 60 60 42.